Rating: Some material may be inappropriate for children under 13. 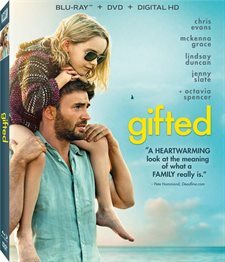 Frank Adler (Chris Evans) is a single man raising a child prodigy - his spirited young niece Mary (Mckenna Grace) - in a coastal town in Florida. Frank's plans for a normal school life for Mary are foiled when the seven-year-old’s mathematical abilities come to the attention of Frank’s formidable mother Evelyn (Lindsay Duncan) whose plans for her granddaughter threaten to separate Frank and Mary. Octavia Spencer plays Roberta, Frank and Mary’s landlady and best friend. Jenny Slate is Mary’s teacher, Bonnie, a young woman whose concern for her student develops into a connection with her uncle as well. Download Gifted in Digital HD from the iTunes store. Gifted images are © Fox Searchlight Pictures. All Rights Reserved. Anyone who has been in a custody battle for a minor knows it can be an ugly affair. It gets even more complicated when it isn't the biological parents fighting. Everyone thinks they have the best interest of the child at heart but personal issues generally come into play, which is why a judge needs to review all the details and make an informed decision. It becomes even more complicated when the minor has an above average intelligence. This heart-wrenching drama is played out in the Marc Webb (500 Days of Summer) film, Gifted. Diane Adler was a math prodigy. She was at the top of her field at the age of 22. By 27 she was enveloped in the world of Mathematics and a single mother who took her own life. Before she died she left her baby girl, Mary (Mckenna Grace; Designated Survivor) with her Brother Frank (Christ Evans; Captain America: The Winter Soldier). Fast forward six and a half years and Frank decides to send Mary to public school despite exhibiting the same gift for math that her mother did. There, it is quickly discovered how smart Mary really is but when Frank refuses to put her in a school for gifted students the principal steps in. Suddenly, Frank's estranged mother, Evelyn (Lindsay Duncan; Birdman) shows up on his doorstep and that is when the trouble begins. Frank saw how hard Evelyn pushed Diane growing up and he promised Diane that Mary would have a normal childhood. Evelyn feels Mary's potential is being wasted in a small town in Florida and wants to take the girl with her back to Boston and MIT. The power struggle pits son against mother in open court and in the end, nobody really wins, least of all Mary. As Webb mentions in the extras, the beauty of this script is the characters. Evelyn is the overbearing mother who loses her shot at "fame by association" when her daughter takes her own life. Frank is resentful of his mother yet wonders if he is really doing the best thing for Mary. Mary is a mature seven-year-old with a love of math and learning in general. The plot and script develop these flawed characters as the audience quickly learns to pity them all. Evans, who is used to playing a superhero in an action film, is really good as Frank. He has a sensitivity that comes across and a no nonsense demeanor that serves him well in the role. Duncan is sophisticated and reserved, just as one would expect Evelyn to be. Grace is the star of the film stealing every scene she is in and emoting a level of maturity not often found in children. Also in the film are supporting cast members Oscar winner Octavia Spencer (Hidden Figures) and comedian Jenny Slate (The Secret Life of Pets). While not a traditional choice for love interest, Slate meshes well with Evans while embodying the essence of a first-grade teacher. The Blu-ray is presented in 1080p with an aspect ratio of 2.40:1. The quality is very good and colors are crisp and true. The audio is well done and the dialogue is sharp and clear and sits nicely in the central channels. The disc offers numerous extras including deleted scenes, Gifted: HBO First Look, Story, an accomplished cast, inside the equation, Marc's Method, on location, a gallery, and theatrical trailer. While none of the extras are terribly long they are enjoyable enough. Family drama usually makes for a good script and while Gifted is no exception, the cast is really what gives the movie its bite. Minor issues (like Evans being too nice to play the part with the venom towards his mother the character should have) are not enough to ruin the film and Grace is a special young actress that I look forward to watching more of in the future. If you like a good, heartfelt story, this is worth watching.